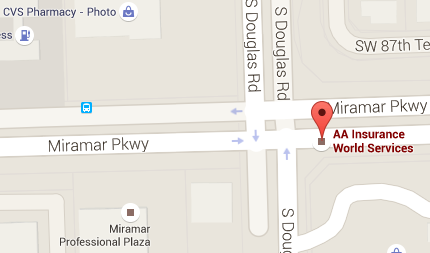 If you're looking to buy an insurance policy from a company you can trust, AA Insurance World Services is a business that clients throughout Miramar and the surrounding areas have relied on for years. Regardless what your coverage needs are, we'll pay close attention to detail every step of the way. Your satisfaction will always be our top priority. As a locally owned and operated Miramar, FL, insurance agency, we're proud to help the members of our community find insurance plans that suit their lifestyle needs at any and every stage of life. If you don't have the time to visit us for coverage during our flexible business hours , we can help you over the phone, by email or through our website . We're also available Saturdays. So give AA Insurance World a call today to find out more about our rates and services.